Welcome to Moose Hollow 102! Enjoy the vacation of your dreams in this two bedroom rustic mountain retreat. With a premium location near two world-class ski resorts, one of Utah's most popular boating destinations, and endless mountain adventures, you will never get bored at MH102! Upstairs: One King bedroom with full bathroom. Bedroom 2: 1 King bed with full bathroom. 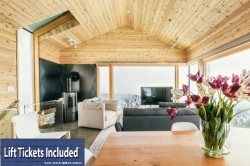 We are truly excited and honored to share our homes with each and every guest and we invite you to stay with us at Powder Mountain Getaways - MH102!